Following attending Civic Center EATS on this Thursday, I got home and checked in Facebook and noticed that East Coast Joe’s was going to be over at Lone Tree Brewing Company. 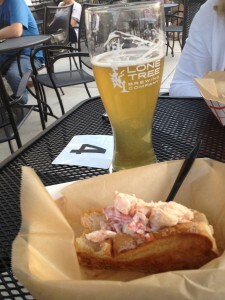 Decided that a lobster roll and a peach wheat beer sounded kind of good out on the patio on a Colorado evening. 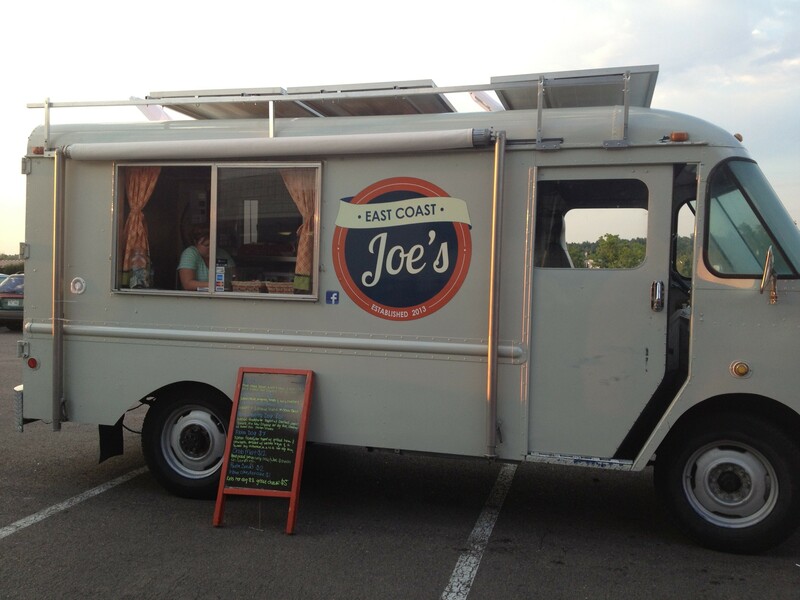 I convinced my wife to head down there with me to sample some of the offerings of East Coast Joe’s. I really like the styling of this truck. It stands out. 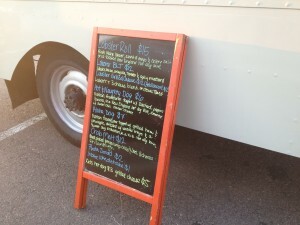 Here is a look at the menu, which is rife with delicious options. But here it is. Look at that thing… you are probably salivating on your keyboard. Joe’s does not skimp on the lobster. And it is amazing. I am not really big lobster eater– I will usually get a nice steak (we do live in proximately to ranch land). 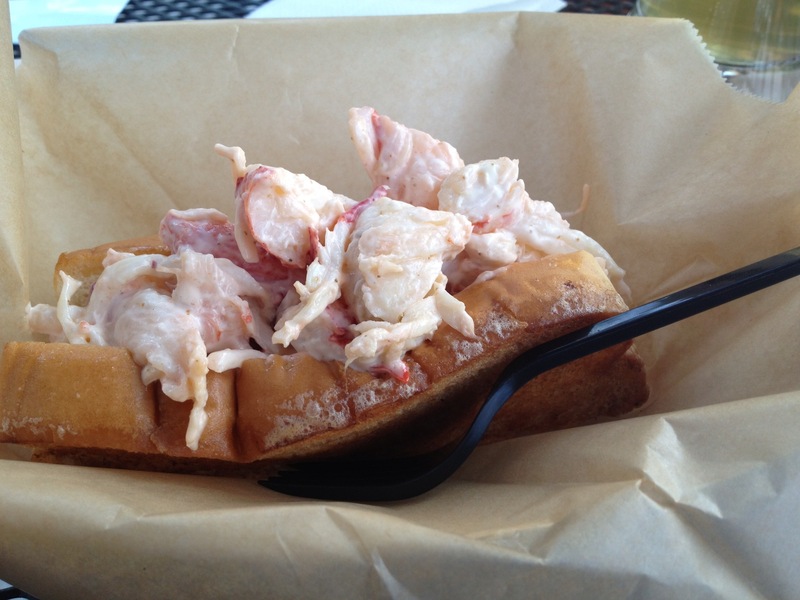 The last time I got a lobster roll was at Steuben’s restaurant, and it was $22 and had less meat that what Joe’s served up (different setting obviously– and it had sides and table service). 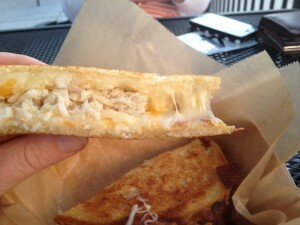 But this thing was just plain good eating. Joe’s lobster is not heavy on the mayo, and has plenty of claw meat – which is wonderful. It is the type of meal that you savor each bite slowly, due to its luxury and its flavor, which is one of my favorite kind of meals. 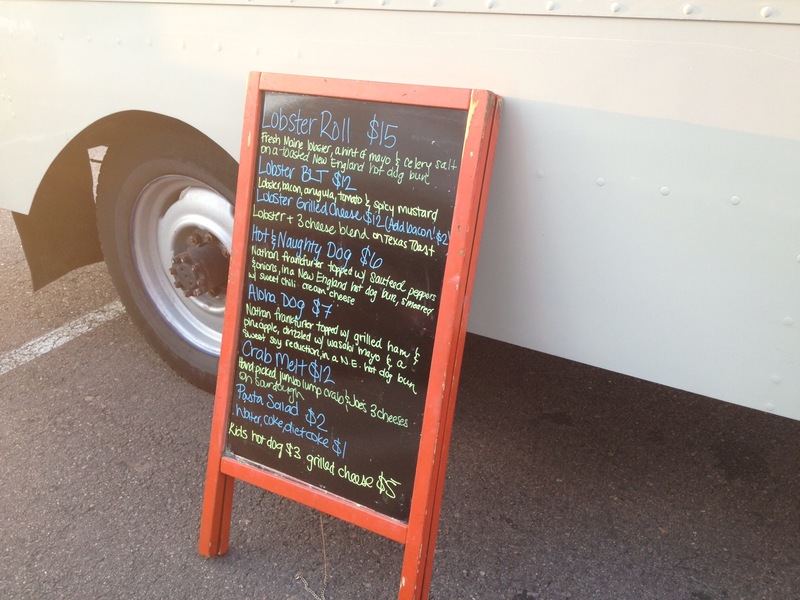 A lot of food truck meals are the type of thing you are scarfing down — a slice of pizza, a hamburger with all kinds of toppings, a sandwich… but with something like this, it is natural to really take your time to enjoy it. I paired the Lobster Roll with the seasonal Peach Wheat from Lone Tree Brewing Company. This is a nice light summer beer, which complimented the lobster and the patio setting. I really like this brewery, which has been improved by the recent addition of a large outdoor seating area. Look at that tantalizing fried cheese hanging off this delectable crab filled grilled cheese sammie (pictured at bottom). Here is a look at the cross section of the Crab Melt. Sorry, I am not much of a hand model. I’ll get a manicure next time. (Just kidding). This was another tasty treat… the cheeses (not sure what kind or type of cheeses these were.. probably a strong cheddar and maybe jack) were pretty strong flavored. 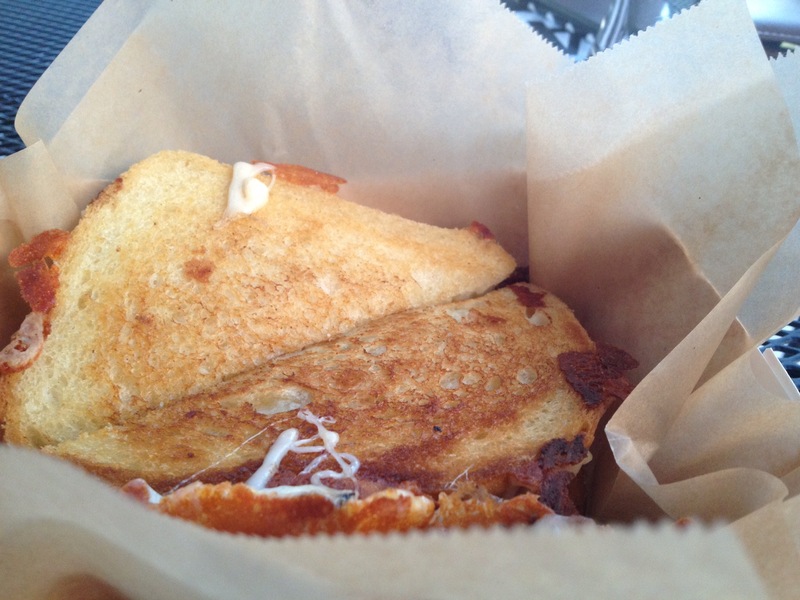 It was a perfect grilled cheese sandwich– stuffed with crab. I thought the crab was nice where it was thick and you could take a focused bite into it to get a mouthful of crab. 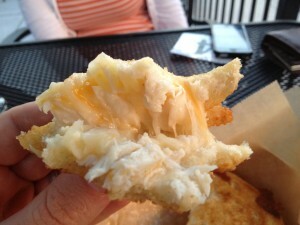 In the event it was subsumed by the strong cheeses, the crab added mostly texture and a hint of crab flavor. Not sure how this could be improved (maybe add less cheese, or a weaker cheese). The sourdough bread was nice on this. I would order both the Lobster Roll and the Crab Melt again– but I think if you had to choose, go with the Lobster Roll. 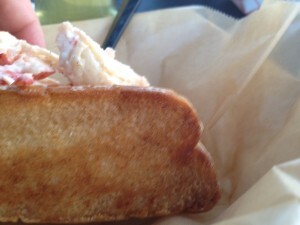 The Crab Melt is a good follow up if you are still hungry to split with a fellow diner at dinner time. This entry was posted in Brewery, East Coast Joe's, Lone Tree Brewing Co., Seafood, South Denver on August 23, 2013 by mlhoppe.